One of the two wives of El-kanah and mother of the prophet Samuel. The first chapter of I Samuel and the first half of the second are almost entirely devoted to her. 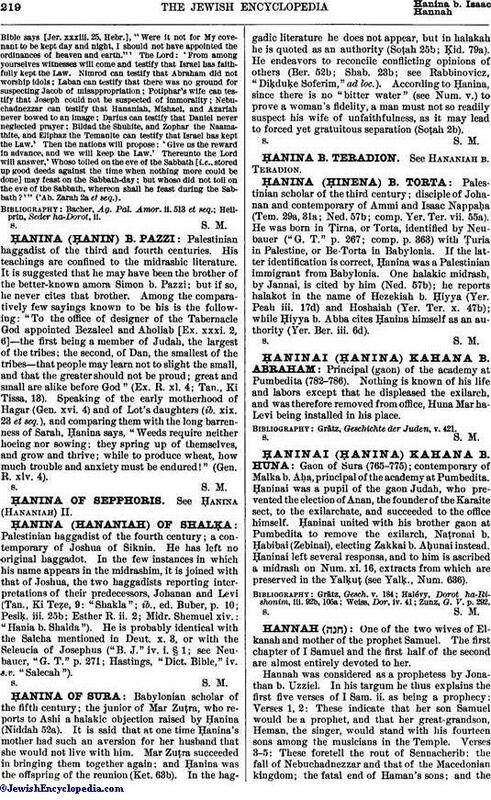 Hannah was considered as a prophetess by Jonathan b. Uzziel. In his targum he thus explains the first five verses of I Sam. ii. as being a prophecy: Verses 1, 2: These indicate that her son Samuel would be a prophet, and that her great-grandson, Heman, the singer, would stand with his fourteen sons among the musicians in the Temple. Verses 3-5: These foretell the rout of Sennacherib; the fall of Nebuchadnezzar and that of the Macedonian kingdom; the fatal end of Haman's sons; and thereturn of Israel from Babylon to Jerusalem. 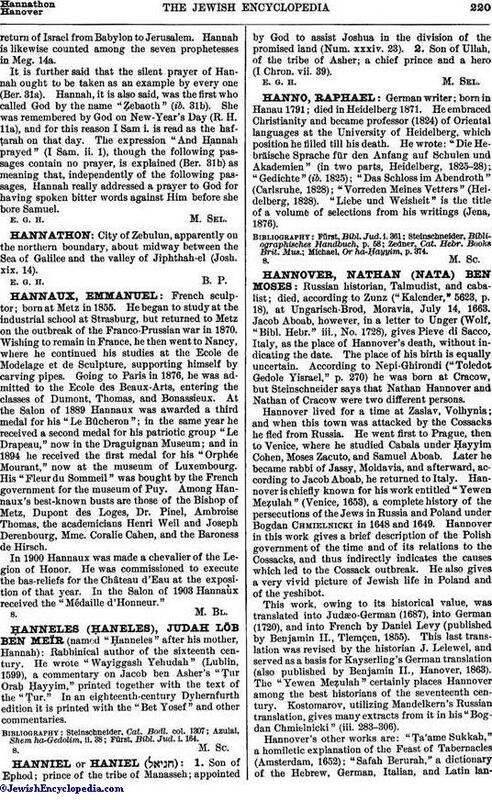 Hannah is likewise counted among the seven prophetesses in Meg. 14a. It is further said that the silent prayer of Hannah ought to be taken as an example by every one (Ber. 31a). Hannah, it is also said, was the first who called God by the name "Ẓebaoth" (ib. 31b). She was remembered by God on New-Year's Day (R. H. 11a), and for this reason I Sam i. is read as the hafṭarah on that day. The expression "And Hannah prayed" (I Sam. ii. 1), though the following passages contain no prayer, is explained (Ber. 31b) as meaning that, independently of the following passages, Hannah really addressed a prayer to God for having spoken bitter words against Him before she bore Samuel.